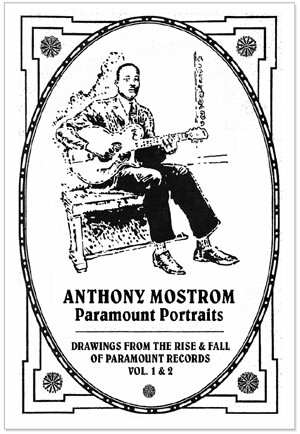 A new Museum exhibit, Anthony Mostrom: Paramount Portraits Drawings from the Rise and Fall of Paramount Records, Vol. 1 and 2, was unveiled on Thursday, September 24, 2015 from 5:00pm - 7:00pm at the Delta Blues Museum. Paramount Records is one of America's most important record labels. The company's open-door recording policy led it to the nation's blues, jazz, gospel and folk musics, capturing a comprehensive anthology of what the country sounded like in the 1920s-30s. Anthony Mostrom, cartoonist, illustrator, and writer, created hundreds of ink portraits of Paramount's recording artists for Jack White's Third Man Records' reissue of the entire Paramount catalogue. The ink drawings were originally published in two "Field Manuals," 700 pages of encyclopedia-style biographies and discographies of 347 musicians.